Here is the official English and bangla statement. This is my third visit this year to Bangladesh to learn about your International Crimes Tribunal and to offer ideas to ensure that the trials it holds will be fair and open. I know of the horrible crimes committed in the country in 1971– of the hundreds of thousands of victims who were murdered and raped, of the pain inflicted and the property destroyed. The victims of these crimes deserve justice, and those accused of these acts deserve trials where they can test the evidence and present witnesses on their own behalf. Those who are innocent should be found not guilty and be freed. Those who are responsible for these crimes should be found guilty and punished. Given the historic importance of these trials to Bangladesh, the region, and the world, the proceedings should be conducted in a manner that is open and accessible to all. In March, I made a number of suggestions on how the rules for these trials could be amended to ensure fair and transparent proceedings. Some of these suggestions were incorporated in amendments adopted in June. Now the first trial has begun with the opening statements of the prosecution last week, and with witnesses due to begin testifying on December 7. The focus of my present visit is on how the International Crimes Tribunal will conduct these trials. The statute and the rules are in place; the question now is how they will be interpreted in actual practice. Much can still be accomplished to ensure that justice is done and is seen to be done in these historic proceedings. First, it is important that the judges, at the first opportunity, define what “crimes against humanity” means. The term “crimes against humanity” has been defined in the statutes and cases of international courts. It has not been defined in Bangladesh. In their charge framing order in the first case, the judges said that they would interpret the statute according to Bangladesh law but look for additional guidance in the decisions of international tribunals. But it is not clear whether the prosecution must prove whether the alleged murders and rapes were committed as part of a widespread and systematic attack against a civilian population; whether they were committed on a racial, religious, or political basis; whether the alleged perpetrators would need to have knowledge of the larger attack. At other courts, the elements of the crimes have been defined by the judges in an early ruling. The same can be done here. Second, it is important that the same rights be accorded to these accused as are guaranteed to Bangladeshi citizens who are charged with other violent crimes. The Bangladesh constitution and laws provided that this was to be a special court responsible for its own rules and procedures. As the judges have amended the rules to incorporate concepts like the presumption of innocence and proof beyond a reasonable doubt, it is also important that they conduct these trials to ensure that the accused have the same right to consult with their counsel, the same time and ability to prepare their defense, and the same time and ability to challenge the process as they would have in other cases. Third, while the rules amendments provided for the protection of witnesses, it is important that a system of protection of witnesses be developed in practice and available to both sides. In the first trial, witnesses for the prosecution have already been listed. The defense must file a list of witnesses by December 7. Witness protection measures must be in effect to ensure that those willing to come forth and tell the truth will not be subject to threats and intimidation. Finally, and most importantly, the process must be accessible to all. It is not easy for members of the public to attend court sessions. Ideally, the trial sessions should be broadcast on television or radio, or weekly reports be aired that would show key testimony, arguments, and rulings. This is being done now in the trials in Cambodia of those alleged to be responsible for the atrocities committed in that country in the 1970s. If this is not possible in Bangladesh, neutral observers should be permitted to follow the trials and produce daily and weekly reports that would be available through the internet and other media. These trials are of great importance to the victims of these horrible crimes. What happens here will send a message to others who would commit these crimes anywhere in the world that it is possible for a national system to bring those responsible to justice. I am here because the people of the United States wish to help ensure that this is a process that is fair and transparent. We will continue to work with all those involved in this process to achieve justice in these historic trials. New York (ANS) – Toby Cadman, eminent British lawyer with an expertise to deal with war crimes and crimes against humanity has said the government of Bangladesh and the International Crimes Tribunal (ICT) should work in a way so that it does not give an idea that they are trying some people because of political opposition. There is a conception that the government is only targeting people from opposition parties. So it may be deemed as politically motivated exercise. The point we are trying to make repeatedly that if the government wants to make its standard as international as repeatedly said by the government ministers, if they are serious in holding the trial in international standard, they have to implement the recommendations made by the Ambassador-at-Large on War Crimes of the State Department of the US Stephan J Rapp, International Bar Association, Amnesty International, Center for Transitional Justice and others, if they can convince the world that they are not conducting trials with a political motive, they can go ahead. But they themselves made it controversial by making open comments that these are politically motivated. My attention draws to one recent comment by State Minister for Law Kamrul Islam as he said this would be the model for the rest of the world, this would be the best tribunal in the world. If it is the case, then implement international standard, allow foreign counsel to appear, allow international observers to monitor the trial, reinstate the constitutional protections that means amendment to the 1st and 15th amendment to the constitution, ensure application of Criminal Procedure Act and Criminal Evidence Act in the ICT procedure and show the world how this can be done. He said this in an exclusive interview at his Manhattan hotel suite on November 16, 2011 with Atlantic News Service (ANS) while he was on a trip to New York, USA. Referring to his experience, he said it is indeed very difficult to hold trial in a fair manner in the country where the crimes were committed. It is almost impossible. Bosnia was not capable of doing that because there was deep rooted animosity between the ethnic groups. To ensure international participation and keeping the court free from fear and emotion a third country is better place to conduct such trial. Toby Cadman is a barrister in Chambers at 9 Bedford Row, London, is a lead defense counsel for the accused Jamaat-i-Islami leader, who are facing charges for their alleged connections in crimes against humanity during the Bangladesh’s liberation war in 1971. Two other members of the three-member team, who are working as advisers to the Bangladeshi defense counsels for Jamaat leaders as they were not given permission by the Bangladesh Bar Council to appear before the (ICT). Toby, who worked as a prosecutor in Bosnian war crimes tribunal, was denied entry to Bangladesh in early August 2011, which created problem to directly interact with the defense counsels. Toby said that Bangladesh has the opportunity to show the world that in a domestic setting trial of international standard can be conducted. In that case the International Crimes tribunal (ICT) of Bangladesh has to ensure that it is sufficiently capable in conducting these cases with the standard of the International Criminal Court (ICC). He said, if the government is insistent that Bangladesh will be a model for the rest of the world in dealing with such cases then the judges of the ICT should be assisted by international advisers, the prosecutors should have international assistance and the government should implement the recommendations made by Mr Stephan J Rapp, Ambassador-at-Large on war crimes affairs of the US State Department. 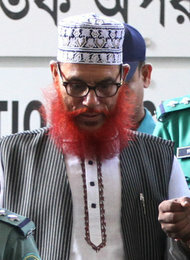 When asked whether he and two other members of his team broke the code of conduct by suggesting the chairman of the ICT to step down for his earlier involvement in an enquiry against Jamaat leader Moulana Sayedee and introducing themselves as counsels for Sayedee, Toby said that we have been made accused by the International Crimes tribunal of Bangladesh of breaching our code of conduct in the United Kingdom. I have read the ICT order. I do not want to say too much about the process as they are yet to write to the Bar Standard Board. But we did not break any code of conduct as we are very much within our professional line. Referring to his experience in dealing with ware crimes cases in Bosnia and Herzegovina, Toby Cadman said, I have spent most of my time in Bosnia where I was on the prosecution side, although primarily I was on the defence side. In Bosnia, the court was domestic, but with international assistance. So there were international judges and prosecutors. These courts were set up to try both military and civilian personnel. During the armed conflict in Bosnia and Herzegovina and indeed the whole region of former Yugoslavia, there were military tribunals. After the end of the war the international community brokered a peace deal. It was deemed inappropriate for cases done by the military courts. So they had created civilian courts to deal with these cases. And the state court in Bosnia with the highest jurisdiction level which would try both civilian and military personnel who were involved in actions during the conflicts. Ordinarily in dealing with cases of such gravity and sensitivity, it generally concerns the actions taken by the military personnel, but there will of course civilian personnel to be charged with such crimes. In Bangladesh, the scenario is quite different and in our view very problematic. The tribunal and the legislation was not for setting up of a civilian court. The legislation was targeted to set up a military tribunal with the intention to try 195 Pakistani military personnel. It subsequently became a court that would try civilians, military and auxiliary forces. There is nothing wrong in doing that and trying civilians. But the problem is the legislation itself. You have to keep in mind and consider the time of the legislation. The 1973 Act under which the present ICT was set up, was not drafted with the intention of trying civilians, but to try military personnel. If the 1973 Act was effectively torn up to start anew and a new Act is drafted and also set new rules, in our view then that would be a sensible way to dealing with the cases. One of the criticisms was that you can tear up a legislation, all laws have retrospective effect and there is a principle in the international law that a person cannot be charged, tried or convicted with a law that was not applicable at the time of committing crimes. But there are exceptions also that the crimes that are international in nature recognized by the international community, such as war crimes, genocide, crimes against humanity and you cannot have a retrospective law in these events. The 1973 Act is retrospective anyway as the crimes were committed in 1971 not in 1973. Responding to a question whether it is possible for the ICT to maintain international standard in conducting cases of such gravity, Toby said, we have also raised our newest concerns as to the Act itself, the rules of procedure and the ICT legislation. One thing is very important that the ICT has to be either national or international. You cannot something in the middle. If it is an international tribunal, there would be international assistance, there would be compliance with international standard and that tribunal would have to incorporate general fair trial procedure as recognized under international law. But the ICT does not. It does not accept international law, does not consider the activities of any international tribunal. So the question is raised that is it then a domestic court? The related laws of Bangladesh are excluded in dealing with cases before the ICT. The Criminal Procedure Act and the Criminal Evidence Act are excluded, the constitutional protections are also excluded. With the exception of appealing against conviction sentence there is no right to make interlocutory appeal. There is no right to appearing to a higher court of a decision of the ICT judges. One cannot challenge the jurisdiction of the ICT. In that sense you cannot say that it is a domestic or national court. So question comes, what is it? They said that it is a combination of two. But it cannot be, you have to be one or the other. When asked how the ICT would go ahead without testimony of eye witnesses and reliable documentary evidence as the charges are being framed based on newspaper clippings and literature, Toby said that war crimes cases are often very difficult, because of the sources of the evidence that are available. There are very little documentary evidence and even little live testimony by way of direct identification of those. War crimes tribunal works on hearsay, by second and third hand evidence, which made it difficult. In Bangladesh, it is even more complicated and difficult as the incident took place 40 years ago, but that does not mean that you lower the standard of evidence. One of the comments made at a seminar when I visited Bangladesh last time in January, that you cannot expect trial of international standard from the ICT. That does necessarily mean that you can lower the standard of evidence. You cannot reasonably convict an individual based on rumor. If we just rely on literature, newspaper clippings, it is not going to give a satisfactory decision. But the judges ultimately have to rule on those evidence. He further said, it will of course be a challenge for the tribunal, because we are looking at complex crimes forty years late. Lot of evidence may have been destroyed, lot of evidence will have in the hands of Pakistan military, many evidence will be in the hands of Indian military and those are not going to be available to the tribunal, and that is a shame and Bangladesh loses an opportunity to end an impunity and the victims of the war of liberation will not get justice. What is crucial to mention that we are not suggesting that crimes did not occur, we are not suggesting that victims on a large scale did not suffer. Everybody know that a conflict had occurred and many people were suffered, there may be dispute with the actual number as it happen in any conflict, but the truth is the crimes had occurred. On a question about involvement of Jamaat leaders in committing crimes against humanity in 1971, Toby replied that the point is that our clients are not connected to these crimes as they had not been in a position to do so in 1971. They were in the political opposition at that time and the trial will show that. There was a pre-judgment in the media due to their political objective. But still we hope to see that the tribunal will conduct trials based on evidence maintaining the principle of fair trial and not on the basis of rumor. The legality of the judgment and the sentences of the tribunal will be judged by the fairness of the trial process. If the trial is fair and credible, then one can justify the judgment. As it happened in many instances that innocent people got punished for crimes committed by others due to absence of proper evidence, whether their clients are going to face the same fate, Toby Cadman said, when a tribunal has the jurisdiction to sentence one person to death then the standard of evidence should be higher and authenticity should be beyond any doubt, because of the ultimate sanction. It is worrying when the ICT is dealing with direct death. Although there is no direct identification by an eye witness that cannot be said that the trial was not fair. In absence of eye witnesses a trial can be fair on the basis of other compelling evidence. We have such cases all the time. In Sebrenitza, I was involved with a case in which the Yugoslav army killed 8,500 Bosnian Muslims and very effectively ensured elimination of all the surviving legacies. So how do you justify that there was no direct evidence. There are other evidence to determine a person’s guilt. If other forms of evidence are satisfactory, which are very high standard that can work. Obviously, it depends on proper assessment of the evidence. I am deeply opposed to death penalty in any form and any circumstances. In the United Kingdom, we have abolished death penalty long ago. Our efforts are on to abolish death penalty from the European countries, those still have such laws. When asked how a trial can be fair when the prime accused 195 identified war criminal were kept out of the jurisdiction of the ICT and only their collaborators are being accused, Toby said, we have come across similar questions many times that why people at the top were not brought to justice when courts deal with crimes of such gravity. Legally there is no wrong in prosecuting only people at the bottom and not bringing top brasses to justice. It is totally a prosecutory decision. You select those cases that you most likely to prosecute. Those were on the top are unreachable, they are in Pakistan and not available. So it is better to target the people at the bottom, you pick those who are easier to pick and don’t go to the top. It has become the transitional justice issue that you are not dealing with the real problem. It is a dangerous matter and dangerous for long-term, because you are not dealing with the root of the problem. It is not wrong, but not sensible. The ICT can do nothing to it as it was not set up to resolve the real problem. Besides, Toby said, our statement was controversial as we had mentioned that the Presidential Decree 16 stopped trial of members of liberation war side for their alleged crimes, they can never be tried. It is obviously not said they have committed crimes, but some of them may have done. There are commentary and literature that suggests that crimes were committed on all sides. If you want to establish a fair process, then you have to bring all sides to be prosecuted. When I pointed this out, I have been told not to say it again.